Thanks to the proof reading by Shae Davidson there are three new games available for you! 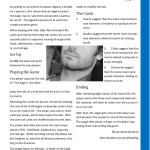 “Paths“, a simple narrative game for two or more players, suitable for newbie and causal players or as a short warm-up before other games. To play download also the [Board] and [Tokens]. on a person’s chin means that an angel touched the baby’s lips to seal them and protect a particu-lar secret. The legend inspired me to write this simple narrative game. “The Wise Man“, by Ivan Lanìa. A wonderful narration game in which the players take the role of an old wise man and the Goddess of Fate, that will help him understand all of his mistakes.